This script will update the library to enable multiple content types and then add the newly created content type. We will first start by opening the SharePoint Online Management Shell as administrator which can be downloaded at https://www.microsoft.com/en-us/download/details.aspx?id=35588. write-host "info: Enabled multiple content types"
Hi I am using this script. It works fine if you list exist in the site collection level as the Content type is also on Site Level. Now I want to add site content type in Subsite list. Please advice what I can do. It gives me this error. This worked beautifully in my use case. 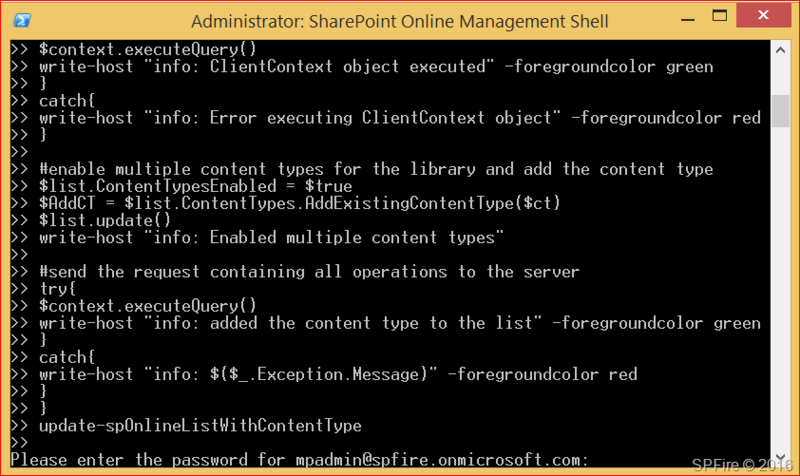 Set it up inside of a foreach loop to add a content type to 116 lists in an SP site. Many thanks!